A start-up company which developed a robotic arm for people in wheelchairs raked in the most awards, including the much sought-after Innovation Excellence Award, at the Tech23 2013 awards held in Sydney this week. 2Mar Robotics has received a fellowship from The University of Melbourne’s Melbourne Accelerator Program (MAP) and brought home five awards from the event, according to a media release. The company, which was founded by former Young Australian of the Year Marita Cheng, has designed and manufactured a voice and iPhone controlled robot arm for people with spinal cord injuries, muscular dystrophy, multiple sclerosis, amyotrophic lateral sclerosis, cerebral palsy and Parkinson’s. 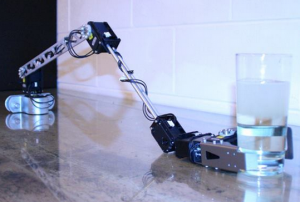 The robotic arm can be mounted onto wheelchairs, bedside tables, kitchens or bathrooms. “Before we started on this project, we interviewed people suffering from a range of conditions to get an idea of their special needs. It was important to us to have the project entirely driven by what is useful to the groups who need it most,” said Marita. 2Mar Robotics is currently working with various end-user groups including the Victorian Spinal Cord Injuries Unit, Austin Hospital, Australian Quadriplegics Association, Spinal Cord Injuries Association, and Paraquad South Australia. Meanwhile another start-up company, 121Cast, received two awards for creating an online platform that delivers a personalised audio experience. 121Cast was awarded an MAP fellowship last year and aspires to be the “radio station” of choice for smartphone owners by offering an “intelligent and contextual audio stream”. MAP Manager Rohan Workman says they are delighted to see that the start-ups that have been created from MAP are being recognised for their high-quality. “The University has been a leader in supporting its students who have an interest in starting businesses and we see this as an important way for them to have an impact on the world,” said Workman. The Melbourne Accelerator Program has just concluded its second year of operation, according to the release, and continues to be a key part of the burgeoning start-up community around the University.